I am also a musician. I’m a concert pianist and organist, and I give recitals throughout the year. Additionally, I teach lessons. My musician friends and colleagues were likewise surprised to find that I write. I have an equal passion for both, however, and have no intention of slacking off in either pursuit. Probably discipline. Both in music and everything else, you need to put in the time. You have to get good at juggling all the balls in the air and keeping a schedule. When I was in college, I would practice 6-8 hours a day on top of homework, meals, my job, and hanging out with friends. Now I juggle practicing several hours a day with writing. In order to succeed in school, you must do what needs to be done without question. This is harder when a teacher’s no longer peering over your shoulder or assigning deadlines, but I still try to set goals and schedules for myself to keep from getting lazy or off track. I don’t know her personally, but Nora Roberts is known to have said "You're going to be unemployed if you really think you just have to sit around and wait for the muse to land on your shoulder." I think this is the case with every discipline. Sometimes I can’t wait to sit down at the piano to practice, or at the computer to write, but other times it feels like bloody work and I’d rather just read or watch sitcom after sitcom on the television! But you have to develop the habit -- sit yourself down at the same time every day and just do it. Both practicing and writing are the most enjoyable types of jobs to have -- it’s wonderful getting paid to do something you’d be doing anyway! You can lounge around the house and make your own schedule, but just like everyone else who has a job, you have to sit down and do it whether you feel like it or not. Plus, I always find that once I really get into a day’s worth of writing or practicing, I fall in love with the process all over again and the inspiration eventually comes. There are so many writers out there -- more than would ever be necessary to enjoy a lifetime of great literature. But, for those of us who feel compelled to be one of them, I think you have to find some way to stick out, some way to make a brand for yourself and your work. I’m still working on this of course, and will be forever, but I keep studying all the really big authors to see what they’re doing that makes them stand out in the crowd. One thing that I think is immensely important (besides writing a really good book! ), is having a great cover. I adore my illustrator Lindsey Loegters’s work, and I’m hoping that having her on board for all of my books will make for an eye-catching, unifying body of work. 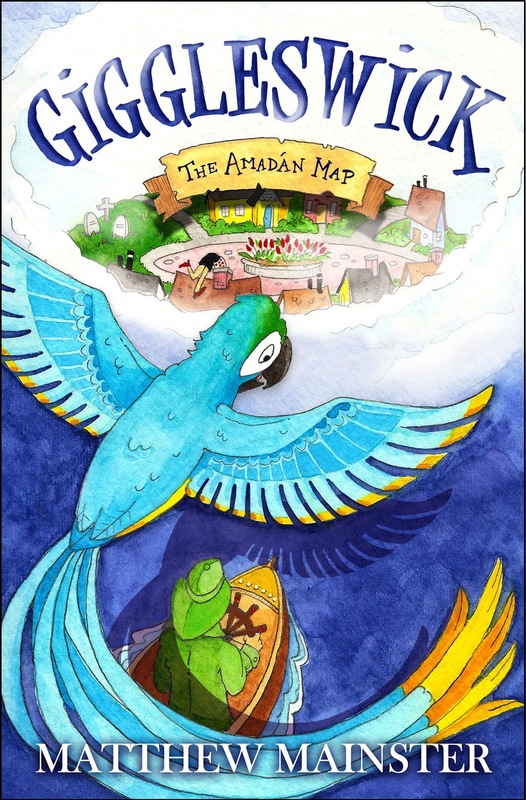 For those who are unfamiliar with your novel; Giggleswick: The Amadan Map, how would you introduce it? Escapist. Whimsical. And hopefully fun. At the risk of sounding conceited, it’s exactly the type of book I’d want to read on a rainy day, or when I’m feeling down or on overload. I've always been fascinated by books in which children escape to another world via everyday means such as wardrobes, rabbit holes, train platforms, Kansas tornados etc., and I drew on these sort of stories for inspiration. The first idea that came to me was of a nation completely hidden by a circle of fog. The fog is always there, and yet other countries are much too absentminded to notice, and even if they did, they'd never make it through the fog alive! What was one of the most surprising things you learned in creating Elliot? He’s much more like me than I’d initially intended. Though I think he’s braver and quite a bit more adventurous! I have always written. Whenever I’d finish reading a good book, I was all the more inspired to write one myself. I wanted to create my own place to escape to ... like Oz, Hogwarts, Narnia or Wonderland. Once the idea for Giggleswick came to me, I was dying to escape to it. Now I’m dying to return for books two and three! Again, I turn to Nora Roberts. Ironically, one of the most inspiring things she’s said is “I don’t believe in waiting for inspiration. It’s my job to sit down and figure out what to write.” She also added, “Don't say, 'I'm going to write when I find the time'—that's the most irritating thing I ever hear. Nobody finds time, you have to make it.” I’ve found this to be absolutely true and I remind myself of it every day. I make a writing schedule and stick to it. It’s a job -- a wonderful job, but one that I have to force myself to sit down and do from start to finish, nonetheless. Now, if only I could write as fast as Mrs. Roberts! If you could introduce Elliot to any character from another book, who would it be and why? Albus Dumbledore, because everyone could use a Dumbledore to go to now and again for a kind smile and a spot of good advice! Well, there are two more Giggleswick books to come, so those are first in line to be written. I’ve just finished another children’s book outside of the trilogy entitled The Periwinkle Turban which comes out this October. After Giggleswick, I have folders full of ideas -- mostly still children’s books. There’s even a series that would probably be for slightly younger children that I hope to get around to in the next few years. I doubt I’ll ever run out of ideas. Well, it’s a bit cliché, but write what you know and feel. Just write -- you’ll never know what your voice or style is until you’ve written something. Likely the first attempts won’t be your best work, but I’m so thankful for my early attempts at writing novels. The two novels I finished prior to Giggleswick were just awful, but they helped me to find my niche, and I’m now much more confident in my writing. Another word of advice: Dissect your favorite books ... what does the writer do that you like so much? I’m lucky to have been many wonderful places, but I think my most favorite spot on earth at the moment would have to be the quaint little town of Camden, ME in which the beginning of Giggleswick is set. I have been many times, and it is the most homey, endearing, relaxing destination I’ve ever encountered. I’d pack up and move today if it weren’t for my family -- I’d miss them too much! I’ve just begun The Red House Mystery by A.A. Milne. It was his one and only murder mystery for adults. So far, the writing is typical of Milne’s charming and clever style. I’m sure I’ll enjoy it. I was lucky to never have to work at a McDonald’s, or as a bus boy at a restaurant. As a musician, there was always a host of odd jobs here and there that were at least of mild enjoyment to me. So, I’m sorry, but it’s kind of a boring answer for this one -- no horrible summer jobs. When Judi Dench cried in The Best Exotic Marigold Hotel. That woman is such an actress! I’m not much of a crier at all, but as soon as her face squinched up, I instantly felt her pain and couldn’t help but cry myself! It wasn’t buckets or anything, but it was slightly ridiculous anyhow haha. I have twitter, but admittedly, I hate it. I’m such a visual person, and Twitter is all text! And poorly written to boot! Plus, I refuse to have a phone glued to the end of my hand. Therefore, I rarely tweet. I much prefer Facebook and Goodreads, and I keep up with both on a regular basis. Readers can find links to all of my social media via my website at http://theworldofgiggleswick.blogspot.com. I’d love to keep in touch and interact with my readers! 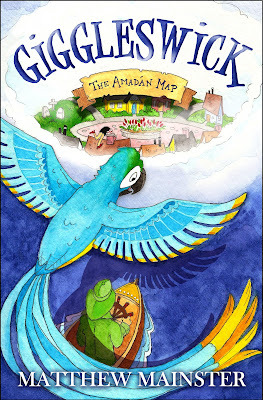 The imaginary world within Matthew Mainster’s Giggleswick is magical and full of surprises. It is truly a feel good book with an exciting and adventurous plot. Once readers are immersed into its captivating story, they will never want it to end. Although the town of Giggleswick is bursting with magic and mystery, it will feel like it is a real place. Matthew is a skillful storyteller. The way he describes the things inside an imaginary city is simply incredible. There are plenty of surprises from beginning to end. This is the perfect book to kickstart to what it is certain to be an amazing series. Thank you Matthew for making this giveaway possible. 1 Winner will receive a copy of Giggleswick by Matthew Mainster. Sounds fun! We'd love to give it a try! Thanks for the review and giveaway. Sounds like a great book to share with our middle-grade readers.